100% Pure L-Citrulline DL Malate 2:1. Citrulline Malate, also known as L-Citrulline DL Malate, is a popular supplement taken in powdered form to increase training endurance, detoxify the body and develop aesthetics. Citrulline Malate is a combination of the amino acid L-Citrulline and Salt Malate. L-Citrulline is a non-protein amino acid compound and is not considered to be one of the essential amino acids commonly obtained through diet. L-Citrulline is found naturally in foods such as watermelon, cucumber and pumpkin. However as the body produces its own L-Citrulline, it falls in the non-essential amino acid groups. L-Citrulline is produced by the body in 2 ways, either from nitric oxide a by-product of Arginine or from nitrogen found in L-Glutamine, both Arginine and L-Glutamine are considered semi or conditionally essential amino acid. L-Citrulline is a very effective precursor for Arginine. L-Arginine is best known as a nitric oxide (NOX) stimulator and vasodilator, relaxing and dilating the blood vessels to help the body shuttle oxygen and nutrients around the bloodstream. This makes L-Arginine a useful bodybuilding supplement; users also report and love the pump effects L-Arginine offers. It’s the interaction L-Citrulline and Arginine produce within the body that make Citrulline Malate a very popular bodybuilding supplement. Citrulline Malate supplements offer the benefits of Arginine and in addition buffer lactic acid and reducing muscular fatigue helping you train harder and for longer. Citrulline Malate also helps detoxify the build-up of ammonia created during intense exercise, facilitating ATP output and advance recovery. Plenty of studies have been performed around the benefits of supplementing with Citrulline Malate for exercise performance and muscle gain. Just 6g each day for 15 days has been shown to increase oxidative ATP production by more than 30% and significantly reduce perceived fatigue during exercise. Studies have also shown it to increase physical recovery after training by up to 20%. Citrulline Malate is a common and effective ingredient found in many pre-workout and intra-workout supplement formulas. Experienced bodybuilders and gym goers like to purchase it in this raw form as a separate ingredient, in order to create their own bespoke nutrition supplements which exactly fit the needs of their training, competing and current lean mass. Our Citrulline Malate supplement is 100% pharmaceutical grade in the better 2:1 ratio, with no fillers, ensuring you only get high quality active ingredients. Citrulline malate is a solid supplement to add to pre workout or intra (during) training drinks. This amino acid enhances nitric oxide and l-arginine levels in the body, volumising muscle cells, creating and maintaining muscle pump and enhancing vascularity. Of benefit to any physique, strength and power athlete wanting to boost muscle size and increase recovery capacity between training sessions. As a dietary supplement, mix 2g with 50ml of water or non acidic juice and drink 1 to 3 times daily or as required. We advise taking citrulline malate as part of a pre-workout or intra (during) workout drink supplement for the best results. 1 flat 1.5ml scoop provides an estimated 1g serving. This scoop is included in the package. The best pre-workout ingredient bar none. Quality from BP is also second to none. stop wasting money on commercial pre-workouts and stock up on your own ingredients in bulk! Citrulline Malate is great for increasing arginine and nitric oxide into your muscles, increasing your pump at the gym and your endurance. I take 6g pre-workout, as this is the clinically proven effective dose. Use this as part of our own version of a pre-workout. we really only stack it with what i have listed, the beta alanine with this is often a staple in most ready made ones. why not cut the middle man out and put in only what you individually need? this is the base of it. def. a must if you are getting serious and need to amp it up. tangy taste, nothing too vile. Haven't tried stacking with other supplements yet. I'm in my sixties and getting back into regular workouts again. At first, I was getting a fair bit of post-workout aches and pains. I did some research and came across Citrulline Malate. I have just received my second 1Kg bag and I can honestly say that this supplement has improved my recovery time and enabled me to get a few more reps in. Highly recommended. This works as expected. 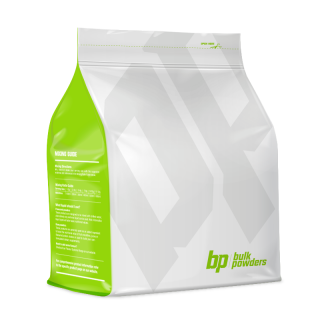 Bulk Powders can be trusted to deliver a good quality product in good time and at a good price. Helps give me energy and prevent muscle fatigue during workouts. Typical sour/bitter taste citrulline malate has but can be easily masked with lemon lime stevia drops or juice.